The Kinder Atina HE's perfect petite proportions and fabulous black reflective interior combined with a spellbinding flame make this little hole in the wall gas fire a magnificent centre piece for smaller modern living areas. The Kinder Atina HE features a maximum heat out put of 3.5kw and is controlled by a fully seqential remote control system with a thermostatic operation so you can alwasy maintain a comfortable room temperature that suites you. This fantastic kinder Atina has an efficentcy of up to 77% with a Dancing flame effect on a Traditional Log bed or Contemporary White Stone fuel bed which both come as standard so you can choose which one you prefer. this fire also come with Safety features that include Flame Supervision Device (FSD), that cuts the supply of gas if the flame goes out or becomes unstable and Oxygen Depletion Sensor (ODS) that detects the oxygen levels in the room fall below a specified level and cuts the gas supply. 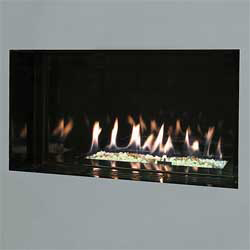 Also is Available with a minimalist frameless fire but is also available with various fascias, 2 wide frames in silver and antique brass or 2 glass fascias available in a silver or champagne finish. Designed for homes with a class 1 chimney or class 2 prefabricated flue, Depth of 325mm fully inset also is availible in Natural gas or Liquid Propane Gas (LPG) and Complete with 7 year manufacturers guarantee.